BART (Bay Area Rapid Transit) located across the street. Oakland Airport 10 miles away. Iron and oak are two of the most iconic elements associated with Oakland. Iron references the shipyards and commerce that have kept Oakland relevant on a global scale throughout history, while oak refers to the fabled groves from which the city derives its name. When used in conjunction, the words connote an evergreen sense of quality, craft and longevity. Our new design intentionally highlights the building’s bold structural beams with natural light while balancing them with soft, organic materials in the furnishings. 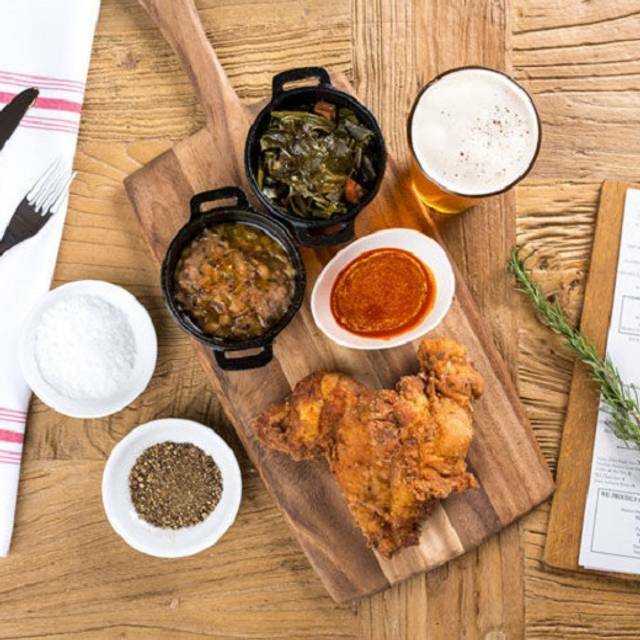 Iron & Oak debuts with an Oaklandish-designed logo and the best of Oakland-sourced ingredients on its robust menu, furthering the city’s booming culinary scene. Chef Angel Chinn-Morales was inspired by the diversity of our community and created dishes to show case and celebrate local and seasonal ingredients. The actual dining area was closed off and instead we ate in the very noisy bar area. Tables were awkwardly wide so it seemed necessary to shout across the table. Service was outstanding, but food was fair - a fairly well cooked ribeye steak was doused in a nondescript gravy - what was that necessary? Also it was served on top of a mound of diced vegetables making it challenging to cut to eat. The staff was friendly and very accommodating. The menu had limited options but a good restaurant to try. It should be known that Iron& Oak is a hotel restaurant not just a restaurant inside a hotel. On top of that the service was mediocre at best and extremely slow. We had a reservation and when we got to the restaurant there were no tables available, probably because it was "seat yourself" on Valentine's evening. The menu was uninspired and the food was plain. I will not be going back to this place. If you want to sit in what feels like the lobby of the Marriott (because it basically IS the lobby), this place is for you. Otherwise, skip it unless you are actually staying at the hotel. Was looking for a good downtown restaurant before a concert. We do not know Oakland at all but found this restaurant on yelp. We did not realize it was inside the Marriott Hotel. So, it is a typical hotel restaurant with some nice options on the menu. Nothing too exciting but not bad as well. Service was great. Very disappointed. We booked here for thanksgiving dinner only to get there and find that the restaurant was closed and were only serving in the lobby bar. We went for Thanksgiving dinner. The photos online made it look elegant. Hah! Five large tv's with four of them on football games do not make for elegant dining. The food on the special menu for Thanksgiving was very good; the food on the regular menu looked ok if you are looking to fill your empty stomach. We were very disappointed. This is a jeans place, not elegant dining. When I made the reservation, I didn’t know that it was a restaurant in a hotel, which was the Marriott in Oakland. Second, the Marriott is undergoing a strike with its employees so the menu was reduced to appetisers. I ended up leaving with my date and going to another restaurant. This was a terrible experience. When we arrived we were told “Oh you weren’t supposed to be able to make a reservation tonight.” Apparently there was a big event and we were clearly in the way. They sat us in a weird area where we were the only diners. They told us they would only offer us a limited menu bc of the event, then gave us each different menus. Then they disappeared so we couldn’t ask which was the right menu. We decided to go somewhere else, but I couldn’t book it through Open Table bc this bad reservation was a blocker (booo!) so my friend had to book it for us. We ordered fries while we tried to figure out where to go next and three wait staff just walked around trying to figure out where the fries were supposed to go, then they eventually just put them on an empty table. When they eventually got to us they were limp and cold. I tracked down our waiter, paid for our drinks (I refused to pay for the fries) and left. I will never return and I will tell everyone I know to avoid this place. This is inside the Marriott hotel in Oakland. Busy restaurant depending on the conferences / meetings going on. The food and drinks were both excellent. 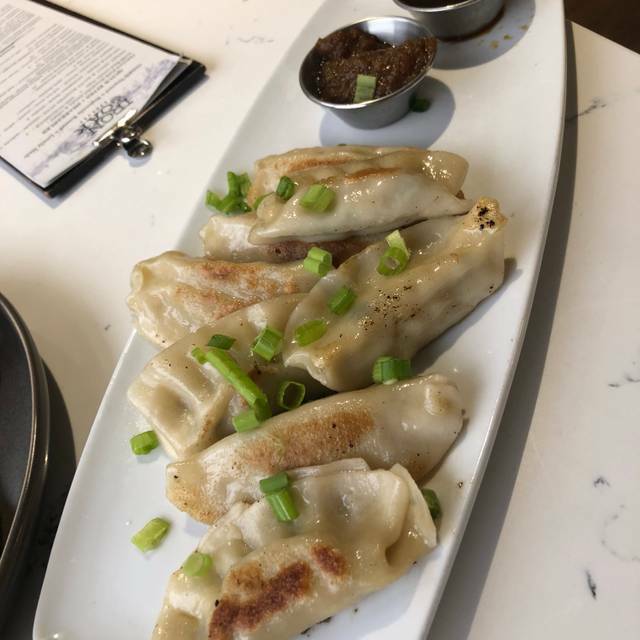 Highly recommend the potstickers . The chili sauce that it is accompanied with is simply delicious. We enjoyed ourselves at the restaurant. Thank you! The drinks were mixed to perfection. Best martini and Moscow Mule. Good appetizers and the food was good. The seating was plenty so if you need an upscale event that can seat a good size party, this is a good place to go. It was perfect for a graduation party. Service was the best. I was able to bring in champagne and cake. They helped serve and set out champagne glasses. Super appreciative of the five-star service. Really made the celebration exceptional. Skip this place. Please! The service was mediocre and the food was even worse. And they charge entirely too much. There are so many better options out there. Trust me. We had an ok experience. Was very over priced for what we had and menu very limited.